The next Fate/Stay Night anime will be more alike in tone to Ufotable's Fate/Zero. Ufotable will animate the next animated series of Fate/Stay Night based on the Japanese visual novel series by Type-Moon. The next television anime series will air this fall. Fate/Stay Night was the first anime adaptation in the series, produced in 2006 by Studio DEEN, who also produced the Fate/Stay Night: Unlimited Blade Works film in 2010. Ufotable took over animation of the Fate/Zero prequel anime series based on Gen Urobuchi and Type-Moon's novel. 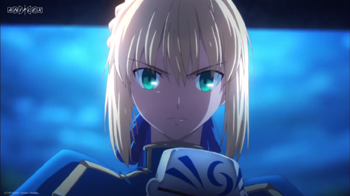 Ufotable's founder Hikaru Kondo previously announced last July that the studio would be making another Fate/Stay Night project, but he did not specify what format it would be or if it would be a remake. Takahiro Miura, director for Fate/Zero will also direct the new anime. Ufotable stated it would continue to move its adaptation of Fate/Stay Night in a more serious direction similar to Fate/Zero, according to an interview in Type-Moon Ace magazine. The scenario for the series is halfway finished and work has begun on several episodes. The original writer for Fate/Stay Night, Kinoko Nasu, is present every time the scenario writers meet as the production staff for the new anime hopes to preserve the feel of Fate/Stay Night as much as possible. Nasu provides background information that wasn't included in the original, which ufotable plans to incorporate. Rumors suggest Nasu has written an original route for the series, but this has not been confirmed. Ufotable also mentioned it wants to "properly write Shirou Emiya as a protagonist," who serves as the protagonist of Fate/Stay Night but not Fate/Zero. Shirou, Rin, and Saber will all have new outfits. A website for the anime opened in December with a teaser video.